Editor’s Note: Please welcome my friend Amy to the site today to share another great post! Make sure you stop by Amy’s site to learn more about all things food and natural living! Unless you’ve been living under a rock for the past few years, you probably already know that raw kale is a nutritional superstar. You’ve may have read that kale has more calcium per calorie than milk and more iron per calorie than beef. Plus it’s packed with Vitamins K, A, and C, high in fiber and powerful antioxidants and is anti-inflammatory. So you want to get more of it into your diet, but let’s be honest. It tastes a little, well, bland. So other than juicing it or blending it in a smoothie, how can you get more of this life giving food into your body without boring your taste buds to tears? I have just the salad for you. My festive roasted beet and kale salad is a little sweet, a little salty, a little soft, a little crunchy and A LOT nutritious. And with all that variety, it’s far from boring. In fact, this is one of my go-to recipes for company or when I bring a side dish to a barbecue. Whisk together 1 Tbsp. each of apple cider vinegar and honey. Toss beets with olive oil and salt and pepper. Roast at 400 for 45 minutes or until soft when pierced with a fork. 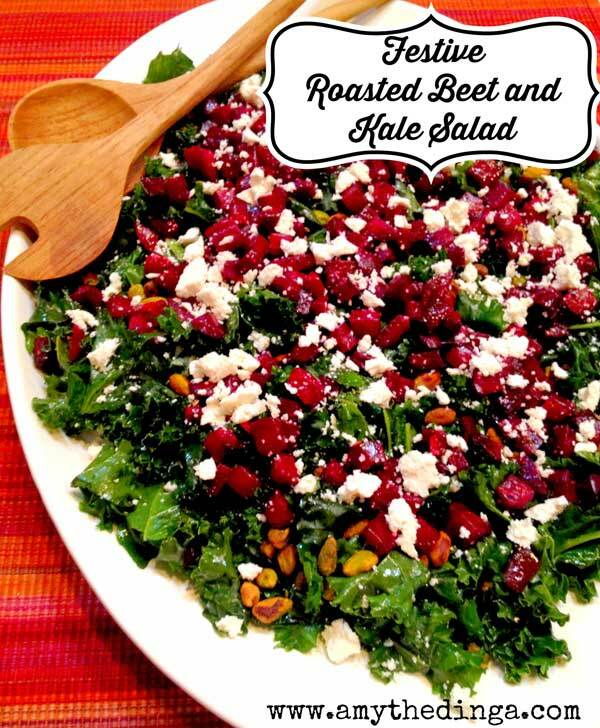 While the beets are roasting, prepare your dressing and toss with the kale. Massage the dressing into the kale so that the kale begins to soften. Allow the dressed kale to sit for at least 20 minutes. During this time the vinegar will begin to breakdown and soften the kale for a more pleasant chewing experience. When the beets are finished roasting, allow to cool completely (about an hour - this step can be done ahead of time and the beets stored in the fridge for up to 3 days). Arrange beets on top of the kale and sprinkle the pistachios and cheese on top. Throw some chicken on the grill and you've got a light and satisfying cool summer meal. What about you? What’s your favorite way to eat kale? Leave a comment and join the discussion below. For tips on how to feed your family whole organic foods on a budget, click here. Love the combination of beats and kale. I think the sweetness of the beats would pair well with the bitterness of the greens, which I can have a hard time eating raw. Are there other ways to mellow out the kale’s bitterness in raw salads? Hi Maria – I personally love the bitterness of kale, so I don’t mind it in salads. The stronger the dressing, the more you will not notice the bitterness. I love using balsamic with kale since balsamic is a very strong flavor. Enjoy!